At least, it’s glorious here in Southern Germany, where our headquarters are located. Perfect weather for a visit to a football stadium – like the Allianz Arena, where we recently provided new cables for the LED perimeter advertising systems. The system previously in place had proved to be too inflexible for regular setup and breakdown. At KLOTZ, we were asked to find a better solution. Read on to find out how successful we were! Is visibility backstage poor – as usual! – and no roadie with a flashlight on hand to help out? No problem at all – at least for our SmartBeam connectors. Their housing features a coding pin to ensure they are always correctly connected – even at night. And if space is at a premium, our SmartBeam Mini is the perfect choice. It offers all the same features as its big brother, but the external diameter is a whole 8mm smaller! Pro users often used to ask us whether there was any such thing as an HD SDI video cable optimized for short to medium distances. In response, we designed the VH8L drum system with VD083LP cable – the perfect solution for distances of up to 70 m.
Don’t miss our Special Offer Sale, offering 3% on all orders in our Online Shop throughout November! 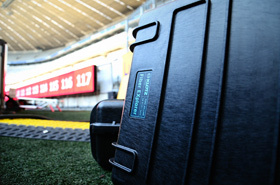 The LED perimeter advertising in Munich’s temple of football, Allianz Arena, was the starting-point for KLOTZ to develop a single-mode version of its SmartBeam Octo System. The system already in place was based on permanently installed wiring with individual opticalCON cables for each of the many LED segments. This arrangement proved to be too inflexible, particularly given the need for it to be regularly set up and taken down. The responsible team from the Allianz Arena approached KLOTZ and asked whether we could supply a better solution that was significantly more flexible to use. No problem – of course we could! We’re always happy to develop new products when a project requires them. In this case, the results were ‘customized’ models of our FiberExplorer and SmartBeam Octo expanded beam connectors. As the optical fibre sub-distributor, the FiberExplorer had to be far larger than the previous standard model, while the SmartBeam Octo connector had to be adjusted for single-mode fibre connection. We also designed the matching cable for the new models – a FiberLink ULTRA with eight single-mode fibres. Our customer received a complete all-in-one system based around the FiberExplorer, which acts as a rugged, splash-water-protected sub-distributor from the SmartBeam Octo to the existing opticalCON cables. The cable outlet is protected with a brush cable outlet plate; connectors comply with the IP 65 water ingress rating when connected. 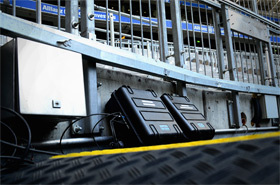 With four FiberExplorers in operation, the new system now provides the maximum flexibility with respect to positioning of the LED advertising and the FiberExplorers. It comprises 32 fibres (4 lines each with 8 fibres, single-mode) instead of the previous 24, which even allows redundancy to be built in to the design. Despite reducing the amount of material used, the new system is now more flexible, faster to set up and break down, and represents the cutting edge of technology. What a win! and its purpose is to ensure the expanded beam is correctly oriented, even in environments with poor visibility. A simple, yet brilliant idea that has long been a standard feature in our products! Pro users are always asking us whether we can supply a video cable that’s optimized for short to medium distances. It should have a low external diameter as well as being highly flexible, suitable for drum storage, and rugged enough to cope with frequent patching. All these enquiries inspired us to design the VH8L.. – the ideal cable for mobile transmission of digital video signals over distances up to 70 m.
In line with SMPTE standards, the VH8L.. transmits a 1.5-GB signal over distances of up to 70 m, and a 3-GB signal up to 50 m – or even more in practice, depending on the transmitter and signal frequency! The VH8L.. is made up with Neutrik’s UHD 4K BNC connectors. And incidentally, the VH8L.. is the “little brother” of our famous and universally appreciated V12L/48DP for long distances.